GUKPT Edinburgh has got off to a cracking start with a record 231 entries for the £10k guarantee Mini Main which began on Sunday. MainEventTravel.com now sponsors GUKPT’s all-in triangles so look out for them on the live stream from Edinburgh. We’re the GUKPT’s Official Travel Partner so let us help you find a great hotel in Edinburgh, and the whole of the 2017 GUKPT tour. Polish player Bartosz Jastrzebski is leading the last 43 players in the £110 buy-in event with 364,000. The winner will get £6,600 with 23 players paid, and a min-cash worth £210. As well as the chip leader, a smattering of other Europeans have also made it to Day 2 including players from Lithuania and Poland. Last year Christopher Riggens took down the Mini Main for a career-best cash of £3,500. The eagerly-awaited £100,000 guarantee Main Event starts tomorrow (March 30) and a host of big names are expected to take part including GUKPT Passport winner Andy “LogJam” Hills who won the recent GUKPT Manchester for £46,987. Thanks to winning the 2016 Passport promotion, Andy is now free rolling every leg of the 2017 GUKPT tour. The first leg of GUKPT’s 2017 tour – in London in February – also made history, attracting a total of 435 entries, the biggest Main Event in GUKPT history. As well as the Main Event in Edinburgh, the schedule also includes a £100 six max event, £82 Omaha 4/5/6 tourney and £110 Bounty tournament. 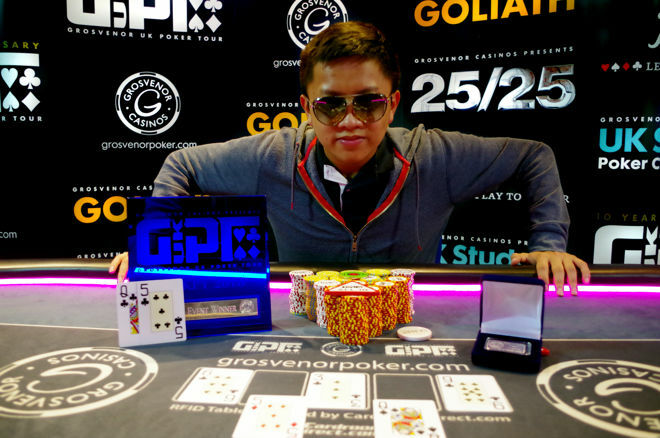 The last GUKPT Edinburgh was won by Tommy Le who topped a field of 184 for £25,000. 2017 is the GUKPT’s 11th consecutive season and promises to provide another record breaking year with a packed schedule and £1.8 million in Main and Mini Main guarantees. There will be nine legs in total this year before the GUKPT Grand Final takes place at The Poker Room above the iconic Grosvenor Victoria Casino in London in November.